Anker is well known for making quality, affordable accessories, and its subbrand Zolo is gaining a similar reputation for audio products. The Zolo Liberty+ true wireless earbuds are among the best in the category, and the company also makes Google Assistant-equipped smart speakers. It also makes the Zolo Halo speaker, which has Amazon's Alexa on board. Zolo's Echo competitor usually retails for $59.99, but right now you can get it for half that price by using this Amazon discount code: ZOLO6688. Head to the product page on Amazon, put the speaker in your basket, then at checkout just enter the code to get $30 dollars knocked off the price. It has both Bluetooth and WiFi connectivity, and of course, you can make the most of some of Alexa's impressive skills to help you throughout the day and control your smart home devices. It should sound pretty decent, too, and it comes with an 18-month warranty for peace of mind. 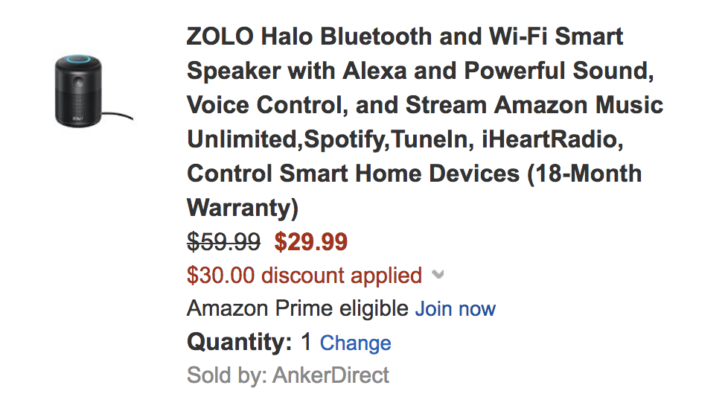 At this price, it's probably a better buy than an Echo Dot if you were considering one.